All it takes for mosquitoes to breed is a cap off of a plastic water bottle with water in it. Water in pet bowls, flower pots and bird baths needs to flushed at least once a week to prevent larvae from developing into adults. Mosquito eggs hatch in 24 to 48 hours and it takes 7 to 10 days for them to enter the pupal stage and become adults shortly thereafter. Adults are a lot like us in that they will seek out shade during the heat of the day and typically rest on the underside of leaves to get out of the sun. For this reason they will rest in shrubbery, ivy, and areas of heavy vegetation. Keeping grass cut and landscape maintained will help to limit them. They are most active at dawn and dusk. 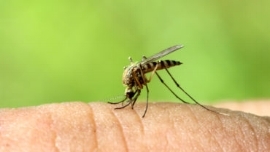 When necessary and possible wear long sleeve shirts and pants and use a repellent with DEET on skin and clothing.